For The Destroyer’s 3rd Birthday, we threw him an Arts & Crafts party since he is our little Arteest! 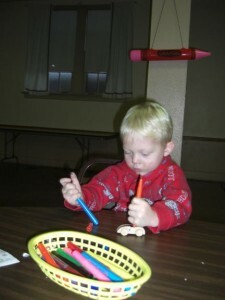 He loves to color and draw. Painting (and getting messy with paint) is also a favorite. Since we invited kids of all ages (ages 1 - 7) we offered a variety of crafts, most of which came from Oriental Trading. 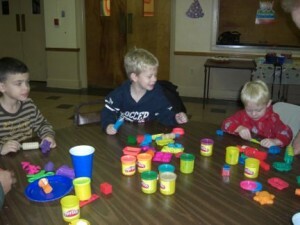 We again used our church fellowship hall for the party and placed a craft on each table. Upon arriving, the first craft the kids did was to make a Craft Bag in which they could take home all of their crafts. We used small, plain brown gift bags with handles. I would have preferred white, but the white ones on Oriental Trading had such horrible reviews. We let the kids decorate them with stickers, crayons, markers and stamps. I purchased some nice foam stamps from Oriental Trading that were much larger than I expected. However, the little kids had a blast with these and were able to handle them well. The second craft they did was a Decorate Your Own Straw Cup. Oriental Trading sells plastic cups with various color tops that include a paper insert which can be decorated. Again, we let the kids decorate with crayons, markers and stickers. The third craft was a “Decorate Your Own Winter Sticker Scene”. Oriental Trading sells various sticker scene sets that come with a large paper scene and a set of stickers to decorate with. Ours was a winter scene that could be decorated with snowmen, kids sledding and animals frolicking in the snow. The fourth craft was a “Decorate Your Own Wooden Car” - again from Oriental Trading. I also bought the wood markers from Oriental Trading as I wasn’t sure if normal markers would bleed or smudge off. The kids could just color the wooden cars. The great thing about these cars is that they fit on the Thomas the train wooden tracks. My boys love playing with them AND their trains on the train table. As you can see in the back of this picture, we decorated with some very inexpensive inflatable crayons that I found on Amazon. Post-party these made great “swords”. The last craft was a self adhesive foam frame that was a blue base with snowflake and snowmen face decorations (also from Oriental Trading). This was a big hit with the adults, but also simple enough for the kids to do as all of the pieces were self-adhesive. They even came with magnets, so you could make them into a nice holiday gift. We also offered 2 free play tables. One was a playdough table. I scored a sweet deal on a 24 pack of playdough on Black Friday ($5.97 - Thank you TARGET!). We put out several canisters of playdough and all of our playdough tools from the 25th anniversary tub. The other free play table was a doodle table. Using a doodle paper roll that I found at the Christmas Tree Shop, we covered a long table and let the kids run wild with crayons. This was great for the younger set who loved scribbling with all of the colors. For the cake, I made an artist’s palette cake. This was the first of 2 birthday cakes where I fully believe that Betty Crocker was out to get me. 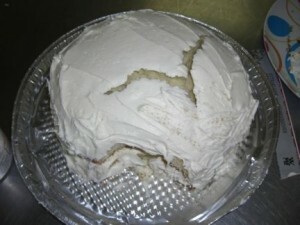 I baked 2 9-inch round cakes. I stacked and filled them with the Philadelphia Ready Made Cream Cheese Filling and fresh strawberries. When I went to frost them, THIS disaster happened. I never cut the domes off the cakes (BIG MISTAKE) and the weight of the frosting caused my cake to crack down the middle (I couldn’t get it to do this if I tried - though the more I thought, I think this would be awesome for a dinosaur cake to mimic the volcanic and seismic activity of the time periods). Not Cutting off the Dome of your cake makes this happen! With some quick assistance from my husband and A LOT of frosting, I managed to fill the cake crater and decorate it as an Artist’s Palette. The brush is a chocolate Twizzler that I frayed at the end with scissors. 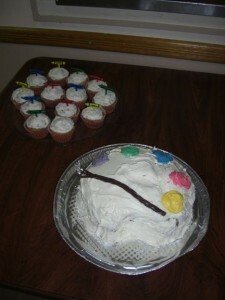 I also made cupcakes and topped them with crayon cupcake picks also found on Amazon. The food for this party was nothing special. I had the usual pretzel tray, sandwiches, chips, veggie tray, cake & cupcakes. Unfortunately, there was only a small turn out due to the early December holiday frenzy. But, even with only a few guests, this party was still a big hit! Incidentally, The Destroyer is born on St. Nickolaus Day and being German, I LOVE THAT. Every year, when he wakes up on his birthday, he finds some extra treats in his shoes!!! 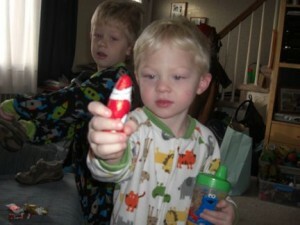 Look at what he pulled out first this year - a chocolate Santa! Arts & Crafts Birthday Party - St. Nickolaus Day has been posted in Crafty Mamamamahoney and Tagged: art cake, art party, artist cake, artist palette cake, arts & crafts birthday, arts & crafts party, crayon cupcakes.